Monash plant scientists have discovered a new molecular mechanism of gene regulation, which could have major implications for the development of treatment strategies for Friedreich’s ataxia – a debilitating genetic disorder that causes damage to the nervous system. The study - the first plant-based original research paper with an exclusive Australian affiliation to the prestigious journal Cell, was published today. “Our findings have opened up unprecedented opportunities with immense potential for human genetic diseases,” said study lead Associate Professor Sureshkumar Balasubramanian, from the Monash School of Biological Sciences. “This research has major implications for our understanding of how the genetic mutation that underlies Friedreich ataxia, leads to damage of the nervous system and thus symptoms of this condition,” said Professor Martin Delatycki, a clinician and researcher from Murdoch Children’s Research Institute who has studied Friedreich's ataxia for more than 20 years. “This may lead to treatments that are desperately needed for this devastating disorder,” he said. Friedreich’s ataxia is the most commonly inherited genetic ataxia affecting young adults for which there is currently no cure. The disease occurs due to a type of DNA mutation referred to as ‘triplet repeat expansion’. In individuals affected by Friedreich’s ataxia, the mutation is present in a region (known as intron) of the affected gene, which is removed during the production of mRNA. However, the presence of the expansion typically leads to a reduction in the levels of the mRNA, which in turn results in reduced protein leading to disease. “While there have been efforts to increase the mRNA levels as a potential therapeutic strategy, it has been difficult, since it was not clear how the triplet repeat expansion results in the reduced in mRNA levels,” Associate Professor Sureshkumar Balasubramanian said. The researchers made their discovery using the model plant Arabidopsis thaliana. “When we found the first and only triplet expansion associated genetic defect outside humans, we asked the fundamental question ‘how do triplet expansions lead to reduced mRNA levels?’,” Associate Professor Sureshkumar Balasubramanian said. “We show in this paper that triplet repeat expansions lead to accumulation of small RNAs and these small RNAs, target the gene harbouring the repeat expansion via epigenetic gene silencing,” he said. 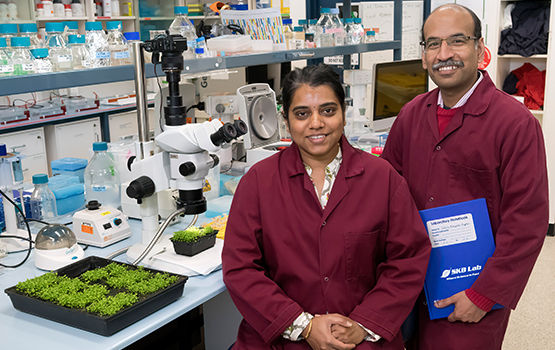 “We have pointed at least 11 different genes in this process and it is remarkable that if we perturb these genes we can abolish the negative impacts of this mutation - at least in plants,” said Dr Sridevi Sureshkumar, a research fellow who shared the first authorship with Dr Hannes Eimer, a recent PhD graduate from the Balasubramanian group. World-renowned plant biologist Professor Detlef Weigel Foreign Member of Royal Society from the Max Planck Institute in Germany, described the work as an impressive example of the potential of basic plant research. “Small RNAs were first discovered in plants, but later found to play important roles in all organisms including humans,” Professor Weigel said. “Now the Monash group has linked them to a phenomenon with great relevance to human genetic disease. Other researchers who were part of the Monash-led study include Avilash Singh Yadav, Calvin Kraupner-Taylor, Andrei Seleznev, Tamblyn Thomason, Stephanie Frances Gordon from Balasubramanian group, and collaborator Professor Bernie Carroll and his student Stephen Fletcher from the University of Queensland. The full paper titled RNA-dependent epigenetic silencing directs transcriptional down regulation caused by intronic repeat expansions can be found here. Authorised by: Chief Marketing Officer, Strategic Marketing and Communications. Maintained by: Science Webmaster Team. Last updated: Jul 2018.